WDIV-TV recently ran a news story about climate change. The image used to illustrate the story was a photo of a generic smokestack emitting a white cloud, which most people would assume is smoke. It’s an illustration used often in media stories that touch on potential climate change. And it is very misleading. It is illegal in the U.S. to operate a coal-burning industrial or power plant that exceeds the atmospheric emission limits set by the Environmental Protection Agency. Coal plants primarily emit water vapor from their stacks; any pollutants emitted would have to be approved in their federal and state emission permits. The photos of these plants show them emitting steam, or water vapor. About 75 percent of what comes out of smokestacks today is nitrogen, a gas that accounts for 78 percent of the Earth’s atmosphere. Another 13 percent is carbon dioxide and 6 percent is water. The remaining 6 percent is mostly oxygen (4.4 percent) with parts-per-million amounts of carbon monoxide, nitrous oxide and sulphur dioxide, according to a Penn State University study. 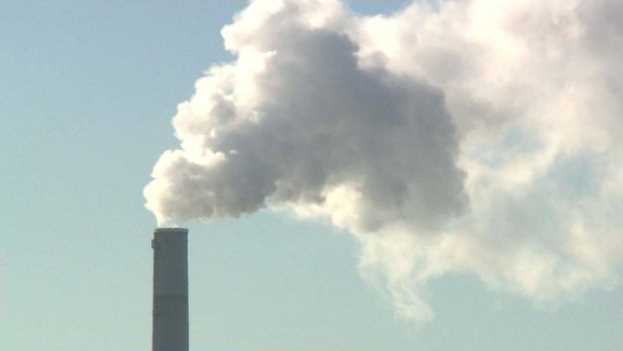 “It is always misleading for a media outlet to report on climate change and then use a picture showing billowing clouds of steam coming out of a stack,” said Jason Hayes, director of environmental policy for the Mackinac Center for Public Policy. Hayes said carbon dioxide is the primary greenhouse gas that comes from a coal plant, but it is an odorless — and more importantly, clear — gas. So a photo of a coal plant emitting clouds of steam really has nothing to do with climate change.